In Malaysia, there is a tourism product/programme that’s called “homestay”. While many might confuse homestay as just staying in someone else’s house during their travels (be it through Airbnb, Couchsurfing and the likes), this tourism product is a lot more than that. It involves staying not just in someone else’s house but also provides a wider experience and unique way to not just travel like a local but also live like a local. This is because (approved) homestay programmes are mostly located in traditional kampongs or villages and offer a window into the local’s lifestyle through various activities (incl. culture, food/cooking, games, etc.) that may involve the whole community in the kampung and not just the homestay family. For foreigners, it’s probably the easiest way to get to know Malaysia beyond the big city destinations like Kuala Lumpur, Penang and Melaka. For locals - especially city dwellers - it gives them the opportunity to experience a real kampung life, which many might not have had the chance to experience. Personally, I have stayed at a few homestay programmes over the past few years, and have previously written and shared a video about one of my best homestay experiences, which was at Homestay Kampung Beng in Lenggong. The short 3D/2N stay there reminded me of my own paternal grandparents’ place back in Terengganu, in the east coast of Peninsular Malaysia. 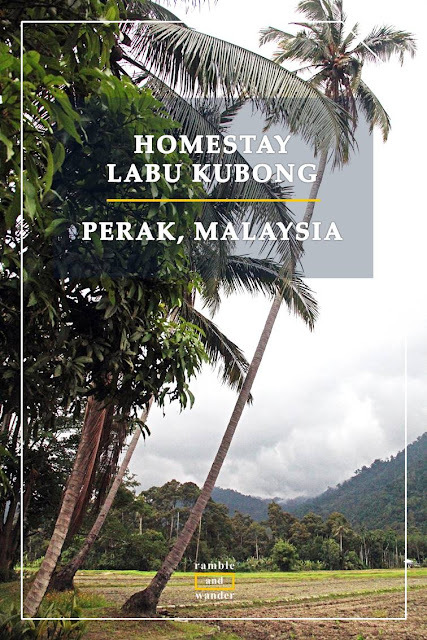 Recently, I had another chance to stay in a homestay, which must have rated among my best experience as well, in Homestay Kampung Labu Kubong, located about 15 km from the royal town of Kuala Kangsar. Incidentally, both homestays are located in Perak - a state just to the north of Kuala Lumpur - which has been selected by Lonely Planet as one of the Top 10 Regions in the World to Visit in 2017. My visit and stay there was during a Tourism Malaysia’s programme called “Jelajah Kesultanan & Tradisi Melayu Perak”, a tour of Perak Sultanate and Malay traditions in Perak’s royal town of Kuala Kangsar. Our arrival at Kampung Labu Kubong was greeted by the villagers who went the extra mile to don traditional Malay songket dresses, complete with the headgear and keris (Malay dagger), that are normally worn just on very special occasions like at one’s own wedding and perhaps at royal events as well. The welcoming party entertained us with some live traditional music before allocating us to our respective foster family. With 2 other fellow bloggers, I was “adopted” by one elderly lady, Rapisah Ab Rahman, whose nickname, among the villagers, is “Mak Su” (means "youngest auntie" in Malay). She introduced herself to us as “Mak” (mother) before bringing us over to her house, located not far from the village community hall. Now, I’d be the first to admit that I’m not comfortable staying at a stranger’s place whilst travelling, what more when you basically have to “live” with the stranger and his/her family, have small chats over TV, eat whatever meals that they have prepared and are having, share the same bathroom, and so on. There’s simply no privacy unless if you stay in your room or go out. One word comes to my mind when I think about this: awkward. This is why I prefer to stay in hotels whenever I go on a trip somewhere. But then again, a homestay programme is not meant just for a quick one- or two-night stay. It is meant to give us the chance to learn more about local life, the culture, the food and the tradition directly from the locals themselves. Luckily for us, Mak Su is very chatty. That broke down the barrier and put us at ease. We learnt quite a bit about her and kampung life in Kampung Labu Kubong, where she moved to after marrying her late husband decades ago. As mentioned earlier, an approved homestay programme in Malaysia usually involves the whole community in the kampung and it has to offer unique products/activities for guests to experience. In Kampung Labu Kubong, there are plenty of activities for guests to experience, learn and enjoy. This includes, among others, rubber tapping, asam keping (sliced tamarind) making, traditional honey production, fruit & vegetable harvesting and cooking traditional dishes/desserts as well as making handicrafts. In just 2 short days, or rather, 1 full day, we did all these, and a lot more. We even caught some fish and played netball in the muddy paddy field, took a dip like happy kids in the irrigation ditch that runs across the paddy fields in the kampung. And that’s what made me really fell in love with Homestay Kampung Labu Kubong. It’s not just Mak Su, our foster mother and chatty host. It’s not just the friendly villagers, and it’s not just the local food that we ate and activities that we did. It’s a combination of all these things and the amazingly scenic views that you get in Kampung Labu Kubong. The mountain range, the paddy fields, the irrigation ditch with water sourced from the nearby stream, the rubber estate, not only give you the chance to enjoy nature and experience the tranquillity that they offer, but also provide you with so many great photo opportunities. Something that would make you treasure the memories of your stay here even more. And definitely, something to remind you to come back again in the near future. Address: Lubok Merbau, 33010 Kuala Kangsar, Perak, Malaysia. For 2017 edition, Badang Malaysia would be held from 15th-17th Sept 2017. Have you stayed at Homestay Kampung Labu Kubong or someplace similar before? What do you think about the experience? Would you recommend it? If you haven't, would you give it a shot? As mentioned earlier, my stay at Homestay Kampung Labu Kubong was part of “Jelajah Kesultanan & Tradisi Melayu Perak” programme with Tourism Malaysia, Destination Perak and KTM ETS (Electric Train Service). KTM ETS provides fast, comfortable and frequent daily inter-city connection between Kuala Lumpur and Kuala Kangsar (for Homestay Kampung Labu Kubong) and beyond, up to Padang Besar near Thailand border in the north. What an amazing experience! I love trying out homestay experiences when I'm off travelling. I'm beginning to like it too, esp if I'm travelling with a group of like-minded friends. The water was really refreshing as it's sourced from a nearby stream that starts from the mountain in the area. How I wish I could have stayed at Labu Kubong for a day or two longer just for this! You're right. The experience of staying at a homestay like in Labu Kubong is not something that you can possibly find and enjoy in the cities. At first, I had some reservation about coming here but when I saw the beautiful landscape right in front of me, I thought 2 days would not be enough. And true enough, it wasn't. I so want to come back here! This is such a great way to connect with locals and immerse in local culture. You got to experience so much in just 2 days! The scenery in Kampung Labu Kubong is beautiful! It was indeed a great way to connect with them and learn about kampung life. It was also really great to see that the community really works together to ensure that our stay was a memorable one. This is such a unique way to explore a destination. loved your documentation. The best kind of travel this is. So good to see the government doing this. This way one can immerse completely in local cultures, cuisines and experiences! I love farm visits and this is something I would absolutely do. Thanks, Divsi! The govt helps and facilitates kampungs that would like to offer a homestay experience in their area. At the same time, the govt sets a certain standard and requirements to ensure that they offer a wholesome experience to their guests so that the guests' interests are protected as well. That's why there is only a small number of approved homestays in Malaysia - to ensure the quality of the products/services offered as well as to protect the interests of guests. What a great idea to look at homestays. I had never thought of them as something you could do, to be honest, as I thought homestays were more aimed at students. Great to know you can get a taste of the local culture! Cute that you were 'adopted' by one of the locals! Must have been fascinating to see them hard at work. Yup! Previously I had the impression that it's more aimed at students as well but this kind of homestays are different. The target market is anybody who's interested to live with and experience local culture. Having said that, student groups also are one of the main customers, I think. I love a good home stay! I did one in Sabah when I was in Malaysia last year and it really surprised me how much I enjoyed it. I definitely didn't think I'd enjoy the rural experience as much as I did. Was it the one in just outside Kota Kinabalu? I'm hoping to try it once there but still haven't decided on the travel date. I know the homestay programme is not that well known but I think the problem is that not much promotion is done on the programme when compared to other available options thus it doesn't register much on the mind of possible visitors. Hopefully the situation would get better. Interesting kampung life...I have been here many times..it is very close to my kampung. I totally love the scenery and landscape there. So beautiful! You're so lucky your kampung is around there too!